The Guardian News polls U.S. Russian relations Who Do Russians Consider Their Greatest Enemies? Who Do Russians Consider Their Greatest Enemies? 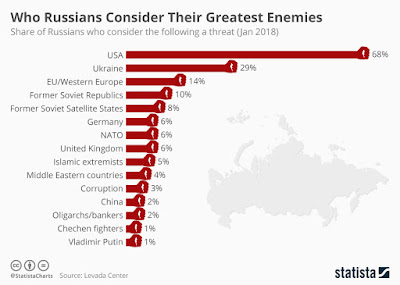 Zero Hedge: Who Do Russians Consider Their Greatest Enemies? According to a new poll from The Levada Center, 23 percent of Russians believe their country is surrounded by enemies. While, the list of who Americans consider their enemies has been covered by Statista before, Niall McCarthy wonders what do Russians think? WNU Editor: I find that number to be very high. It is true that the only country in the world that could obliterate Russia is the U.S., and compounded on how bad relations have been for the past few years/decades most Russians have become instinctively wary of the U.S.. But as an enemy?!?!?! That is not the impression that I am getting from my family and friends in Russia.